Not that we don’t know that there are almost as many vehicles in the USA as there are people, that automobiles utilize only 15–20% of the energy we pump into them, that each gallon of gasoline produces 8.8 kg of CO2, etc., it is just that these statistics and awareness do not lead to any concrete action plan, either individually or as a society, that could neutralize the transportation-related environmental policy discussions. We blame the leadership, operational issues (bike paths, parking, thefts, and bus routes), lifestyle, etc. No doubt there is some truth to all of these, but the main culprit still is personal lethargy. It is so much easier to get up in the morning, get in your car, and go where you want to go. What a life! What a freedom! What a luxury! But what is next? To what does this lethargy leads us? We have heard enough about global warming, the inevitable extinction of fossil fuel, etc., so no need to repeat all that. I just want to bring to your attention a few simple facts that, I hope, will help people think of an alternative-transportation strategy. The efficiency of bike riding is 3,200 passenger-miles per million BTU. This efficiency drops to a pathetic 280 passenger-miles per million BTU for an automobile1. 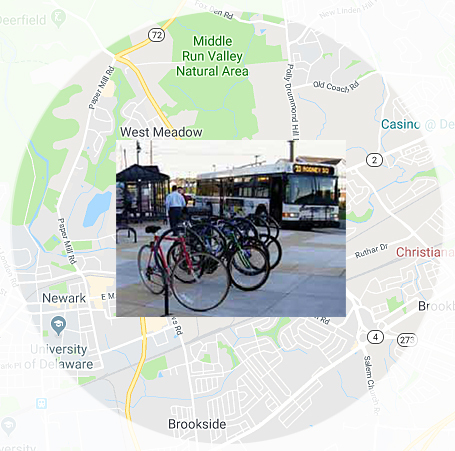 Coupling the fact that about 65% of New Castle County is urban with the fact that DART First State (DART) buses serve about 70% of this urban area2 means that about 45% of all of New Castle County is served directly by DART. If you extend the served area merely by a two-mile diameter from a DART bus stop, the percentage goes up to almost 75%. That two miles is what bothers most of the people, and that is the gist of my blog—What if we combine bike riding with bus riding? I live about a mile from the nearest bus stop for a direct bus to the University of Delaware. I live six miles from the University. I ride my bike to the University every day. However, there are a few days I am unable to do that. On those days, I ride my bike to the DART bus stop, put the bike on the bus, and ride the bus. All DART buses are equipped with bike racks, and they will give your bike a free ride. This is just the first step. I am hoping that this bike-and-bus habit will eventually lead to an all-biking habit, and then, one day, I envision a Cantonese-like bike density on Kirkwood Highway that even the county will not be able to ignore, such that it will be forced to construct a dedicated bike path. Or even better, perhaps with the reduced number of automobiles, it will be able to dedicate one of the traffic lanes to a shared bike-auto lane, a la Main Street, Newark. Ismat Shah is a professor of materials science and physics who specializes in energy and environmental policy at the University of Delaware.